Content text : Simply East London by Tube and Bus Painting commissioned by London Transport from Sarah McMenemy. 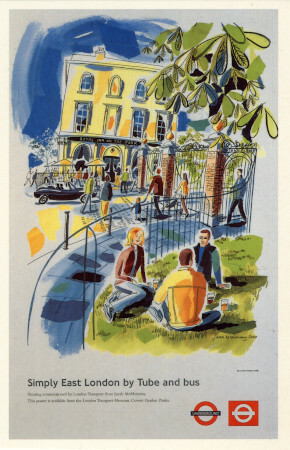 This poster is available from the London Transport Museum, Covent Garden Piazza. 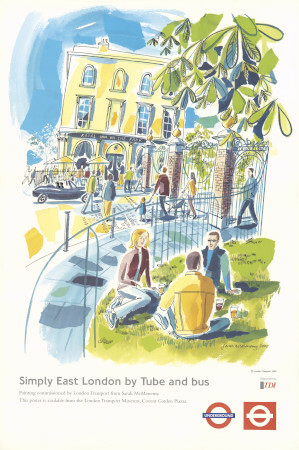 Additional information : This London Transport poster promotes leisure travel to East London. 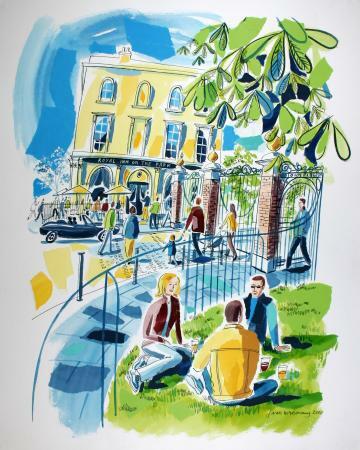 Sarah McMenemy's vibrant painting depicts the Royal Inn on the Park, a popular pub at the Lauriston Road entrance to Victoria Park. When they travel by bus or Tube, everyone can enjoy a cool drink in the sunshine after a walk in the park. Eating out in London was often promoted by Underground posters. Some encouraged weekend of evening visits to one of the city's many restaurants. Others were aimed at commuters, suggesting eating out after work, rather than travelling home at rush hour. As well as sophisticated dining in the West End, posters also promoted taking a picnic in one of London's many parks.